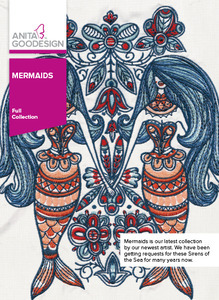 This collection is full of mermaids, fish, whales, and even an octopus, all drawn with amazing amounts of detail. The collection includes large scenes as well as small individual designs. The designs are all stitched with a minimal amount of thread colors for easy stitching. We love stitching these designs on clothing. The variety of designs included will make choosing which ones to stitch first nearly impossible! Most if the designs come in multiple sizes for different hoop sizes and applications.